This new tool by HP will help IT departments to streamline routine tasks performed on the equipments in the data center, combining features and technologies that belong to both the world of developers and of the technical operators. The stated objective by HP, in the words of Manoj Raisinghani, Senior Director, HP Software Product Marketing, is to point to the DevOps paradigm, trying to bring together the developers to the IT departments. This option is used to facilitate the work of the design, implementation, customization and distribution of testing services and products both in traditional IT environments, as well as in the public and private clouds. The HP tools were so gathered in open source technologies such as high-caliber Chef, OpenStack and Hadoop to ensure that level of management and orchestration required to faster growth of the data center. In order to achieve the purposes described so far, HP has the solution peppered with so many new utilities. For example, part of the bundle is joined HP Enterprise Maps, a business management solution that helps to devise and implement infrastructure investments that companies usually face. According to HP, one of the major problems for IT departments is the incredible waste of time related to the planning, construction and management services in enterprise data centers, operations that take place using tools such as Word and Excel not really fit for the purpose. HP Enterprise Maps allows to evaluate requirements, plan a map of intervention and enforce directives more easily, forming a sort of continuity between the infrastructure requirements and the execution of the investment. Thus, the bundle contains Chef embedded in the latest release of Cloud Service Automation. Also according to HP, the success of Chef is an indication of its ability to emerge as a standard open source in its field of reference and it is the this reason that the company encourages IT departments to follow the manual that developers code Chef follow, for begin to make it available also in production environments. Not to forget, Rackspace first made the Chef a practically useful tool on IaaS – Rackspace Deployment. This Article Has Been Shared 4961 Times! 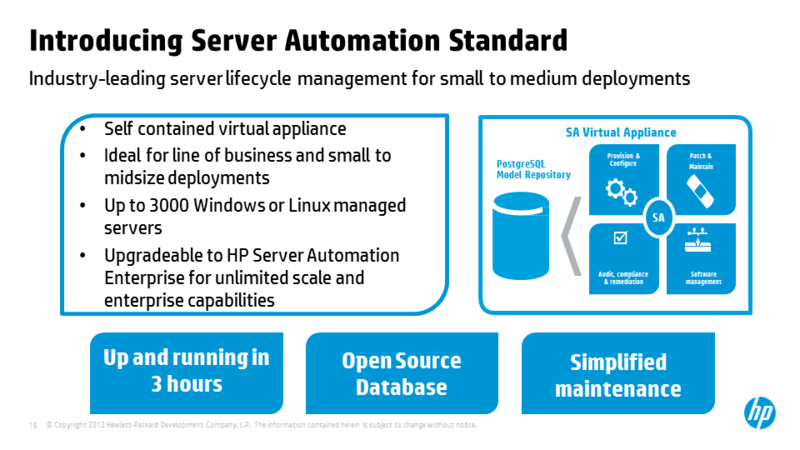 Cite this article as: Abhishek Ghosh, "HP and Automation in OpenStack Based Data Center," in The Customize Windows, June 8, 2014, April 23, 2019, https://thecustomizewindows.com/2014/06/hp-automation-openstack-based-data-center/.